Natural beauty isn’t reserved only for those with good genes. Have you ever met someone who spends minimal time getting ‘ready’, yet always seems to look fabulous? The overly done up, high maintenance look can be fun for a once-in-a-while occasion, but there is so much more freedom and flexibility to enjoy when you aren’t a slave to a complicated makeup routine. How do you keep it simple and carefree, yet and still look great and feel confident? 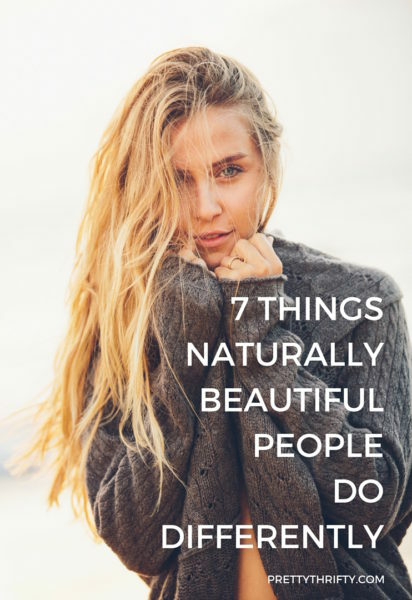 Here are five things that naturally beautiful people do that help you to bring out your natural beauty and let it shine. This. Seriously, wearing a smile vs. not is THE biggest difference between looking attractive and approachable vs. not. No amount of makeup can take the place of a genuine smile. This isn’t to say that you’re not allowed to ever be sad. All of us go through good times and bad. But the key is to always TRY. Try to be your best. Try to do your best. Then let that be enough and make a conscious decision to look on the bright side no matter your situation. We’ve all heard that ‘happiness is a choice’. That can make it sound so simple, like it’s this quick, easy decision. It’s not. What it is though, is a decision to take the positive approach in each situation. These small decisions add up and become our habits, which determine our overall happiness. Yes, it does take effort to choose to be positive, but the amount of energy you spend is worth it. And it is far better spent than the energy it takes being unhappy. The better you take care of your skin, the less you need to cover it up, and the more you can feel confident in your own skin. A lot of women cake on makeup to hide what’s underneath, but thick layers of foundation can often make your skin even worse. Downward spiral, here we come. Try switching to a healthier foundation product like a BB or CC cream or a mineral foundation. Some of these products are actually good for your skin and have anti-aging benefits. They also have a lighter, more natural look. My fav is Peter Thomas Roth’s CC Cream Broad Spectrum SPF 30 Complexion Corrector. It protects against future sun damage with it’s SPF and improves your existing skin with Vitamin C and E to even out your skin tone, support your natural collagen, and protect against free radicals. A couple other helpful tips? Drink plenty of water (see #3) and get enough nutrients (see #4). Lastly, wash your face before bedtime and follow up with a good moisturizer. This helps prevent the unnecessary aging that happens otherwise. The healthier and clearer your skin is, the more your natural radiance will shine through. Drinking enough water each day affects everything from your energy levels to the condition of your skin. You look more radiant, more rested, and fresher. You have more energy which carries over to the vibe you give off to those around you. Keep a water bottle with you to make sure you get in your 8 glasses per day. A healthy diet containing fresh fruits and vegetables directly impacts the condition of your skin. Essential vitamins and minerals help combat aging and dullness. They’ll also improve your skin tone. Eat lots of brightly colored fruits and vegetables. Walnuts, eggs and yogurt and are also great for your skin. So much stress and effort goes in to the ‘smoke and mirrors’ part of beauty, but you know what? Taking care of your body has a much bigger impact on how you look and feel than that expensive skirt or that designer shade of lipstick. Sure, it’s fun to splurge on something nice every now and then, but you will look and feel better if you pay more attention to your fitness than your fashion and beauty purchases. And no, I’m not talking about killing yourself at the gym. You don’t need to do a crazy intense workout every single day. Just doing a moderate workout a few times a week will boost your metabolism up a notch. But the most important benefits of exercise aren’t just physical. You will literally feel better. Your mood will improve and you’ll feel more confident. Both of these can be spotted a mile away. This is such a tough one. Almost everyone has a ton of reasons to skimp on sleep – and most of us do. It’s almost to the point where getting 7-9 hours isn’t ‘normal’ and seems like a luxury few can afford. Of course some of our reasons for skipping sleep are unavoidable. Kids especially don’t leave us with a ton of options sometimes. But when possible, getting enough sleep will ensure you have a well rested glow. You’ll also have the upper hand on managing stress, one of the #1 culprits in taking a toll on our looks. You can definitely play up features and feel like you’re putting your best foot forward. But don’t lose yourself in the process. YOU are beautiful. You shouldn’t have to try to look like someone else. Nice post,.. Loved reading it,..
Great tips and so many self reminders of things that I could do better! This was a great tip and it was interesting too! Hi! My favourite tip is to take care of your skin so you don’t need to cover it up, so true! Thank you! Love these tips to enhance your natural beauty. Thank you for caring enough to help us out sharing these tips and pointers. I will be using this to help keep care of myself. I want to be one of those people! I have to work on a few of those steps I guess. These are great suggestions! I’ll keep them in mind. Thanks for sharing this is so true. I hate make up. It is a rare occasion if I wear any. Great tips! I really need to get more sleep and drink more water. These are some great tips, thanks for sharing! You’re right – you don’t need to have good genes to be naturally beautiful! Such simple and basic things but sometimes so hard to follow. I completely agree with number 7 especially! Wearing makeup shouldn’t be for the sake of wearing makeup. It should be either to enhance your natural features or as a way to express your artistic talents and ideas. I loved reading this post. Thanks!! True. Smile and moisturize your skin among all the other things. Some put on too much makeup trying to be someone they are not. This sounds like a logical theory. This was so encouraging thanks for the great tips. Great tips, I do some but definitly need improvement in others. I agree that a smile is the best thing to be beautiful. Everyone is beautiful in their own way.I think beauty begins on the inside. Lol I like the picture about having the man surprised when your make up goes on, vs when the make up comes off. I don’t wear a lot of make-up, usually just foundation and eyeliner on a daily basis, but if I don’t wear make up to work and I leave my eyes and face naked, people tend to comment how exhausted I look. I find it amusing because I’ve come to learn its’ bc I’m not wearing make-up. Granted, sleep definitely plays a role in how fresh you look for the day. I love the note about a genuine smile. A good smile can be everything! I agree. I think I need to drink a bit more water than I do. These are great tips for everyone. Thanks for sharing! Interesting post. Doing some, working on others. So very true. I need to get more beauty sleep. I am constantly feeling tired lately. I agree i ll try to keep up with these rules!! One tip I learned from my high school drama teacher was to wash with warm water and always follow up with cold water to close the pores. It’s worked great so far. Great post1 I’d seen it on pintrest and wanted to read but hadn’t had the chance yet. Thanks for sharing. Great tips–I wish I could have told my younger self to always wear sunscreen on my arms, face, neck and chest daily and to never sunbathe. I stopped getting tons of sun by the time I was 30 (I’m 55 now) but I wish I hadn’t gotten all the sun I did as a teen especially. I agree with all this! Also, don’t drink too much alcohol as alcohol tends to dehydrate the skin. Great article thanks for all the tips.I agree with this. This was a good read. I agree with them all. All natural is the best. I need to take better care of my skin. But I think I’m still beautiful. Everyone is. Great advice! I am getting older and starting to see more wrinkles and fine lines. I will certainly be taking this advice for not only better skin but a better me! So true.. It’s nice to remember! Good article, seems very simple so start young! I need to be better about smiling more and getting enough sleep! All of it speaks to the confidence “naturally beautiful” people feel. Lucky folks. Thanks for making me aware of what I need to keep up with to let my natural beauty come out. I definitely need more sleep. I stay up after the kids get to bed because that’s the only time I have to myself though. These are some great tips, I totally agree I just have to remind myself to practice them everyday. I need to do some of these! These are great tips. I need to remember to do them. Thanks for posting! I do most of these things. I don’t really think that I’m beautiful, LOL, but that might just be me (I do like my hair though). But doing these can make us all look our best! These are great tips! I always wash my face every night to get the make up off! 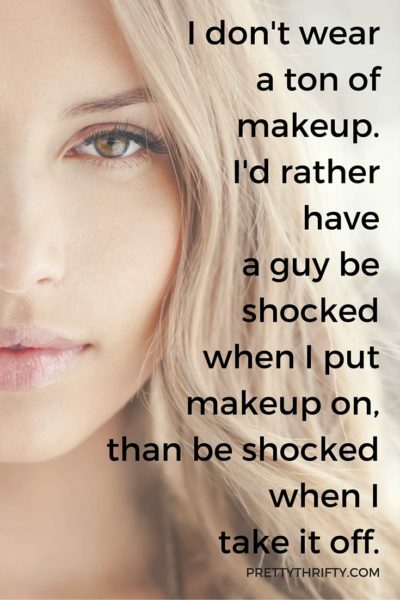 I love that quote about makeup! I feel that too much makeup detracts from natural beauty anyway. Great Post! I agree with everything. I only wish I liked water! I hardly EVER drink water but I can down a pot or 2 of coffee in a day!! ITs all about the smile! Great tips! I know this but seem to forget – so it’s a great reminder. I love this post! So true and honest… Especially the post on the guy being shocked when…! That’s me! These are all great tips but I believe smiling is the best way to show off your outer and inner beauty.. A smile lights up your whole face for the world to see…. This all makes perfect sense! Loved reading this!! Thank you for sharing.